There’s a widely held belief among fitness and health experts that people who truly want to lose weight and keep it off should replace diet sodas and other artificially sweetened beverages with nature’s no-calorie drink: water. You know who stands to lose a lot of money from people believing that? The same industry that funded a new study that concluded that diet drinks are better for weight loss than water. The study [PDF], from researchers at the University of Colorado and Temple University, was fully funded by the American Beverage Association, whose membership list contains nearly 40 different Coca-Cola bottling operations and just short of 30 Pepsi bottling businesses. It was published in the June 2014 of the journal Obesity. Researchers looked at 303 men and women of varying shapes and sizes, broke them into two groups — those drinking beverages with non-nutrient sweeteners (NNS) and those drinking water. And even though the study plans to look at the results of these two groups after an entire year, the researchers went ahead and published the results of solely the 12-week period. Why would they do that? Possibly because the results are favorable to the people funding the study. “These results show that water is not superior to NNS beverages for weight loss during a comprehensive behavioral weight loss program,” reads the conclusion right there at the top of the study, with absolutely no caveats or qualifiers. But if you read deeper into the the study, there are some things left out of the talking points at the top. Like the fact that in order to be eligible for the study, participants had to consume “at least 3 NNS [diet] beverages per week.” So the participants were not water drinkers, or sugary drink drinkers beforehand. They were people who were already regular drinkers of diet drinks. After the Results, in the Discussion portion of the published study, the researchers admit that maybe this had an effect on the results. “It should be noted that because eligible subjects were already NNS drinkers assignment to the NNS treatment did not require as great a behavior change as the Water group who had to abstain from NNS beverages for the trial,” reads the study. Another glaring issue with the study lies not in the methodology, but in the researchers’ decision to publish before the end of the full 1-year period of the study. 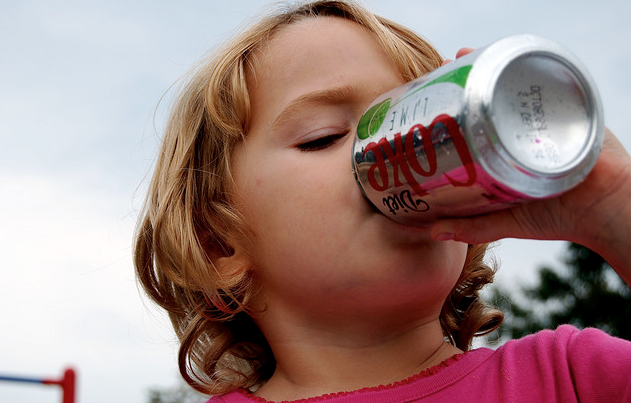 “This brief, 12-week study adds to the evidence that artificially sweetened beverages do not increase appetite and weight gain, though the researchers should not have published a paper until the whole year-long study was completed,” says Michael Jacobson, Executive Director at the Center for Science in the Public Interest, in a statement to Consumerist. “Whether artificially sweetened drinks lead to a little greater weight loss than water is something that will have to be confirmed in the final report on this study and then by future studies, ideally not sponsored by the beverage industry. Jacobson also points out that this study does not take into account other concerns about artificial sweeteners. “It’s important to keep in mind that other research has linked long-term consumption of certain artificial sweeteners, including aspartame, acesulfame-potassium, and saccharin, to cancer in animals or humans,” he says.